Our year-end countdown of most-viewed content reaches Number 7, originally published June 11. Earlier Top 10 reposts are linked to at the end. A pilsner variety of Stroh's will be brewed in Detroit, apparently starting soon. Dustin Walsh of Crain 's Detroit Business pops the tab on news that "Stroh’s is returning to Detroit," as his scoop begins. 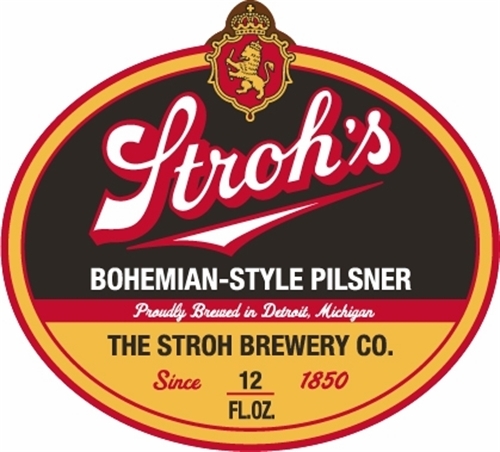 Brew Detroit LLC, a 68,000-square-foot brewing facility at 1401 Abbott St., received [federal] label approval on June 8 . . . for Stroh’s Bohemian-Style Pilsner. The brewer, which brews beers for Michigan brands, such as Atwater Brewery, Badass American Lager, Motor City Brewing Works and Big Red Beverages, will likely brew the beer for Stroh Brewing Co., which is owned by Milwaukee-based Pabst Brewing Co. . . .
It’s unclear when Stroh’s Detroit-brewed beer would be available for purchase. The label reads “Proudly Made in Detroit, Michigan." The “European-style pilsner brewed in the heart of Detroit" will be 5.5 percent alcohol by volume. Stroh’s was last brewed in Detroit 31 years ago. The company was founded here in 1850 by Bernhard Stroh, a 28-year-old German immigrant who learned Brewing from his father . The Crain Communications headquarters where Walsh works ion Gratiot Avenue at I-75 is on the site of a brewery, bottling plant and warehouse that Stroh's shut in 1985 and later razed. Frances Stroh, a fifth-generation member of the founding family, spoke Thursday [June 9] in Midtown Detroit to promote her new memoir, "Beer Money."